Crab cakes are the quintessential summer fare and Maryland’s crab cakes are legendary. The secret to a good crab cake is the crab meat and lots of it, in Maryland plucked fresh from the Chesapeake Bay. The light sweet lumps of white crab meat with just enough breading to give them crunch as you bite into them and keeping the flavorings simple, lets the crab cakes sultry flavor and aroma loll you into a blissful meal enjoyed while imagining gazing out over the bay on a warm summer evening! Pick through the crab meat and remove any bits of shell. Place in a colander and drain, applying pressure with your fingers to remove excess water. Toss to loosen the crab meat and refrigerate until you are ready to add it to the other ingredients. If the crab meat comes in briny water it is best to rinse before draining. Place the mayonnaise in a bowl and add the chives/or scallions, parsley, lemon juice, cayenne, salt, and white pepper. Mix until well combined. Add the crab meat and fold it in gently without breaking up the meat. Scatter ¼ cup of the breadcrumbs over the crab meat mixture. Whisk together the egg, mustard powder, cream, and nutmeg and add it to the crab mixture, gently folding the ingredients together until well combined. Cover the bowl with plastic film and refrigerate for 1 hour or place in the freezer for 20 minutes. Once the crab meat mixture is well chilled, using a 1/3 cup measure, proceed to form 2 ½ inch round cakes about 3/4 inch thick, molding the cakes with the palms of your hands until firm, but not overly compressed. Dredge the cakes in bread crumbs to coat evenly on all sides, using the palms of your hands to lightly press the bread crumbs onto the surface, and place on a parchment lined tray. Cover with plastic film and chill the cakes for at least 30 minutes, or place in the freezer for 20 minutes, before cooking. They may also be refrigerated for several hours or overnight. 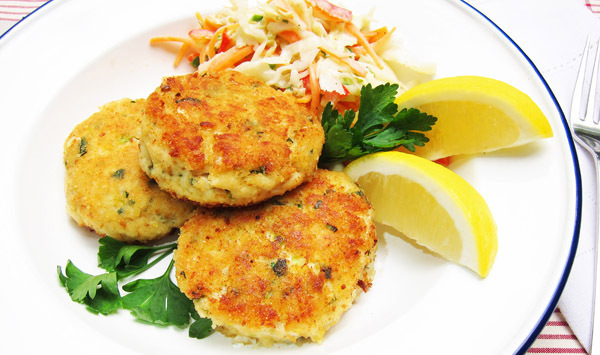 It is best to cook 3 crab cakes at a time to avoid crowding and have ample room to turn the crab cakes easily. Heat 1 ½ tablespoons clarified butter in a non-stick saute pan over medium heat until it begins to bubble and coats the entire surface of the pan. Using a spatula, gently place the crab cakes into the pan and cook for 3-4 minutes until lightly browned. Adjust the heat if you find the cakes are browning too quickly. Carefully turn the cakes over and cook an additional 3-4 minutes until lightly browned. Remove from the pan and place on a tray lined with paper towels to absorb excess fat and set aside covered with a kitchen towel. Wipe the saute pan with a paper towel to remove any bread crumb debris, add clarified butter and continue to cook the remaining crab cakes in batches of three. Once all the crab cakes are browned place them in the oven for 10 minutes. Finishing the crab cakes in the oven avoids over browning in the saute pan. Remove the crab cakes from the oven and serve immediately with fresh lemon wedges. You can use any unsweetened bread you like. Contrary to a popular notion, it is better to use fresh bread. Cut loaf into slices (cutting off the crust if you wish) and place in the oven at 250F/120C for 20 to 30 minutes, letting the bread dry out without browning. Break up the slices into pieces and place in a food processor and pulse, or bash the bread placed between kitchen towels with a rolling pin, into fine crumbs. If you have leftover bread crumbs it is best to freeze them to maintain freshness. Excellent recipe. For courser bread crumbs, dry French bread quartered (crust removed) pieces in the oven and then use the course side of a box cheese grater to make the crumbs. These are more of a Panko style crumb. Just a variation that adds a pleasant texture and appearance to the cakes.